I know it has been done before but look how cool a small grouping of similarly colored yarn bottles look. The best part, is that they are super duper easy to make and adaptable to any holiday gathering. They make a great gift for family as well! Centerpiece anyone? Wash and dry your bottles and/or cans and gather up yer supplies. Squeeze a liberal amount of glue all over the bottom portion of your bottle. Use your finger to coat. Beginning with the bottom of your vessel, start wrapping your yarn around and around pulling a tad tightly as you wrap (I held the jar upside down while wrapping). The yarn can overlap previous wrappings but won't stick unless there is a lot of glue. Because we are using one color, the wrapping can be as neat or as wonky as you want. It all looks pretty festive. You can work with shorter lengths of yarn or from the ball. If you need more yarn, cut another length and add a dollop of glue to the end, press down next to where the previous strand ended and begin wrapping again. The more uniform in shape the bottle or can is, the easier it will be to wrap. You may want to work with cans if your kidlets are under age 8 or perfectionists. If your jar slopes inward at the bottom, begin your glue and wrapping a little higher, otherwise the yarn will slip under and there will be a lot of frustration (not like I'm speaking from experience or anything, ahem.) Super fat yarn would work very well for your younger tots. You can add button, sequins or pom-pom decorations when your jars are dry if you like. Plastic bottles may not hold your glue as well as the glass. 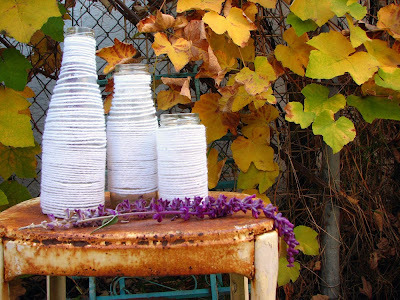 Use eight smaller jars and you can turn this into a Menorah! If your kidlet is having trouble holding the bottle and wrapping. Plop it over the handle of a wooden spoon and plop that into a wad of play clay, or can anchored with wads of paper inside to prevent slipping. But I must say that your bottle are more elegant. ;-) Thanks for the fun. This was so fun! We love it. Thanks for posting! aw thanks! i am happy you all had fun! wee bean bag for wee ones by a wee one herself!